Mitt Romney's 2012 campaign was focused on reversing President Obama's economic policies, which relied on government expansion. Romney's plan was to get the government out of business because only the private sector has the economic muscle to create the millions of jobs needed. To do this, Romney would have lowered personal, investment and corporate taxes. He would have made the Bush tax cuts permanent. He wanted to lower the corporate tax rate from 35 percent to 25 percent and permit businesses to write off capital investments made in 2010 and 2011. Romney would have eliminated dividend and capital gains taxes for all households earning less than $250,000 a year, and end the estate tax. To offset the revenue loss, he would have reduced non-defense government spending by cutting regulations and government departments. Enforcing government regulations costs $1.75 trillion, according to Romney's calculations. To reduce this, Romney would only allow new regulations if the cost was offset by eliminating other regulations. He would also streamline regulations so they no longer inhibit the energy production of nuclear power, coal, oil and gas. Romney wanted to introduce a Constitutional amendment that requires a balanced budget. He also called for reducing Medicare except for current seniors. Romney wanted to enable the states to solve their unfunded pension obligations. He wanted to return some of the federal power to the state level. 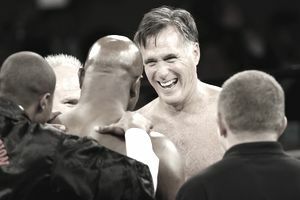 Romney would tie unemployment benefits to worker retraining, which he would streamline "instead of the existing 47 separate programs run by nine federal agencies." Romney argued that Economic Stimulus Bill boosted growth, but only temporarily. Romney would have eliminated Obamacare. He claimed it increased taxes and regulations, created uncertainty, and stifled business expansion. He blames unemployment on Obama's bowing to labor union demands such as mandatory arbitration. Romney proposed a "Reagan Economic Zone" that advocates a partnership among countries committed to free enterprise and free trade. He also wants to move forward with the free trade agreements with Colombia and South Korea. He would prosecute trade infringements with China, without starting a trade war. End Obamacare by returning that authority to the states to design their own health care solution. Order all agencies to eliminate Obamacare and all other regulations that inhibit job creation, and then cap annual increases of regulatory costs at zero. Issue oil drilling permits for pre-approved areas. Cite China as a currency manipulator and assess duties on Chinese imports if China does not float its currency. Reverse Obama's Executive Order encouraging using labor unions on government contracts. Reduce the corporate tax rate to 25 percent. Approve the Colombia, Panama, and South Korea Free Trade Agreements. Study how natural resources could be better utilized, and initiate all approved leases. Consolidate federal retraining programs and return their funding and management to the states. Cut non-security discretionary spending by 5 percent across the board. Research showed that general tax cuts create 4.6 jobs for every $1 million spent. Romney's proposals to cut personal taxes would put more money into consumers' hands, increasing spending and boosting the economy. However, extension of unemployment benefits would be a better tax cut, because it creates 19 jobs for every $1 million spent. That's because the unemployed are more likely to spend every dime they get. Imposing tariffs on Chinese imports, or insisting that China allows its currency to rise, would have increased import prices, possibly triggering inflation. It would also ruffle relations with America's biggest banker. Returning health care and retraining to the states is like eliminating these services since the states are cash-strapped and laying off workers. Romney's desire to reduce Dodd-Frank banking regulations could allow them to further invest in derivatives, which helped cause the 2008 financial crisis. Romney had no proposals to help the housing market by reducing foreclosures. The pipeline of shadow inventory that was somewhere in the foreclosure process is hanging over the housing market, keeping prices depressed and prohibiting investors from buying homes. Until this problem is solved, a large engine of the U.S. economy is crippled. Like other Republican candidates, Romney based his platform on the theory of supply-side economics. This states that tax cuts stimulate growth, thereby increasing the tax base and ultimately offsetting the loss in revenue. Supply-side economics seemed successful during the Reagan Administration, when tax cuts did boost the economy out of recession. However, the maximum income tax rate was 70 percent, not the low 30 percent top rate we have today. Reaganomics proposed a reduction in the growth of government spending. In fact, government spending was stimulative, increasing by 2.5 percent a year. As a result, Reagan doubled the national debt. Finally, Reagan did reduce government regulations on banking. The result? The Savings and Loan Crisis of 1989. Both supply-side economics and Reaganomics are based on the Laffer Curve. However, Laffer himself cautions that tax cuts might not stimulate the economy at all if the tax rates are already below 50 percent and the economy is not growing. In fact, tax cuts and reduced government spending could throw a weak economy back into recession by cutting unemployment benefits and other cushions right when they are needed the most. Former Reagan Administration budget direction David Stockman said that Romney needed a "...remedial math course before January 2013." Stockman should know since most of Romney's economic fixes are based on Reaganomics, which worked well in ending the 1980 recession, but won't help today. Reaganomics promised to stimulate the economy by reducing the growth of government spending and regulation while cutting both income and capital gains taxes. Romney goes even further -- not just reducing the growth of government spending, but actually reducing spending by $500 billion a year. He also wants to increase defense spending -- taking another page out of Reagan's economic playbook. However, Stockman says the numbers just don't add up, because Romney can't reduce government spending "...without taking a fire ax to the Pentagon budget and sharply reducing Social Security payments to the more affluent current retirees." Romney's specific budget-cutting proposals, including cutting Medicaid from the Federal budget, reducing government workers' pay and cutting waste, only total $320 billion, according to Bloomberg. Romney's plan to reduce taxes and increase defense spending will only add to the deficit, not reduce it. Reaganomics worked because the highest tax bracket was 70 percent, not the low rates in place today. It needed to be cut. Reaganomics also worked because Reagan promised only to reduce the growth of government spending. In fact, Reagan's increased spending by 2.5 percent a year. This also helped to boost economic growth. Unfortunately, it also doubled the debt by the time Reagan left office. Romney claims that his proposals will boost economic growth to 4 percent a year. This is known as trickle-down economics. It says that what's good for business owners and investors will be good for the economy overall, and therefore for workers. However, all the tax cuts since Reagan's era have not accomplished that. In fact, income inequality has increased. Between 1979 and 2005, after-tax household income rose 6 percent for the bottom fifth of income earners but rose 80 percent for the top fifth. Reduce the lowest income tax bracket to 7.5 percent. Eliminate payroll taxes on seniors. Eliminate savings, capital gains and dividend taxes for those earning less than $200,000. Reduce the corporate tax rate to 20 percent. Allow 100 percent expensing of equipment for two years. He then pushed for a fivefold increase in spending on energy and automotive technologies. He would have overhauled the tax code and fight new regulations, including tougher fuel-economy requirements for cars and trucks that Congress recently passed and Bush signed into law. Make Bush tax cuts permanent. No increases in Social Security taxes. Pass amnesty "patch" for middle-income taxpayers to avoid excessive Alternative Minimum Tax. Make Research & Development tax credit permanent. Making Bush's tax cuts permanent wouldn't have helped the economy until 2010 when they expired. Since Romney proposed a patch on the Alternative Minimum Tax, it is unclear how much revenue would be lost. This would add to the budget deficit. His other proposals to cut taxes would put more money into consumers' hands, increasing spending and boosting the economy. Supply-side economics states that growth will increase the tax base and ultimately offset the loss in revenue. Unfortunately, this theory has never been proven. Therefore, without a decrease in spending, tax cuts would increase the budget deficit. This would put downward pressure on the dollar, increase inflation, and ultimately weaken the economy. Increasing fuel economy may help decrease reliance on oil, thus lessening inflation. However, increased fuel economy often leads to more miles driven, so there may be no net improvement. Decreasing business taxes may help corporate profits, but may never find their way into lower prices, thus helping consumers.